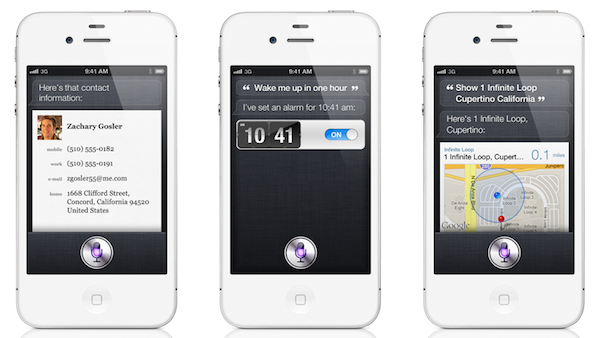 Following the iPhone 4S official announcement at its media event in Cupertino, Apple has formally taken the wraps off Siri, the new voice-based assistant Apple has been rumored to be building for quite some time. Phil Schiller kicked off the Siri demo saying he wished modern devices would understand the things we're asking them. Natural language, normal questions like "Should I take an umbrella today?" or "Will it rain tomorrow in Cupertino'". 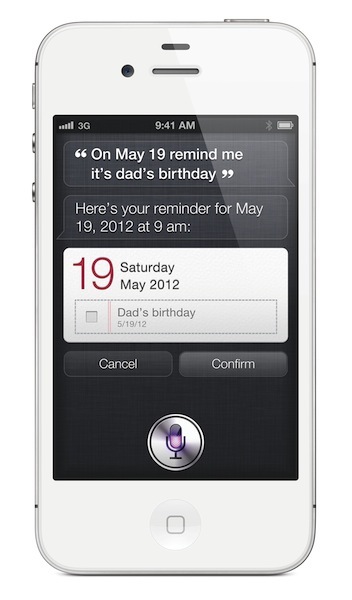 Siri will be able to respond to a user's questions, and provide information and data in real-time in brand interface. The design looks largely similar to a mockup posted last week. Siri will be able to check the weather, stocks information, find nearby restaurants and places, set alarms and even give you directions. Siri will also be able to send text messages and read them, which can be particularly useful if you have an iPhone in your pocket and using a Bluetooth headset. Siri knows, and always remembers. For example, Apple gave a demo in which, upon receiving a text message, the user had to know whether he was busy on a specific day. From a single Assistant interface, which was brought up following the new text message, Scott Forstall had a "conversation" with Siri, asking it if he could schedule a meeting on Friday. Siri checked on the upcoming Calendar events, found a free spot, and "replied" a meeting at the previously specified time would indeed be possible. Siri then transcribed a text message, and sent it back in the original SMS conversation. Siri can look up words, currency conversions, email people, set reminders and calendar events, find addresses -- it also integrated with Wolfram Alpha to check on information available on the popular online service. The interface uses a mix of linen -- judging from some early screenshots -- conversation bubbles, and textured paper objects. As previously rumored, systemwide dictation is also available through Siri. 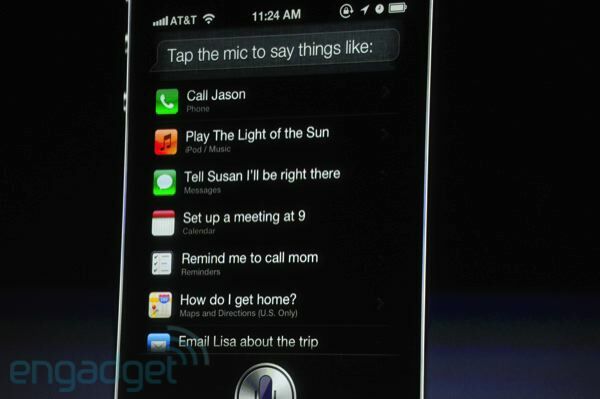 Siri is a new feature of the iPhone 4S. The first "beta" period will support English (US, UK, and Australia), French, and German. 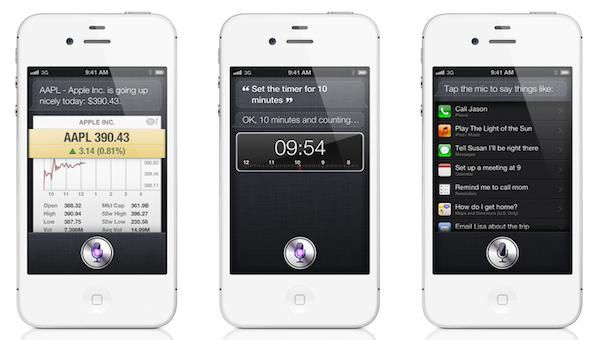 As you can see, Siri is integrated with several iOS functionalities and applications such as Maps, Weather, Clock and Address Book. The data and information coming from these system apps have been completely redesigned to fit Siri's interface, which uses a mix of linen texture, standard iOS controls, and embedded "cards" for things like stocks data, maps and weather. Siri not only understands what you say, it’s smart enough to know what you mean. So when you ask “Any good burger joints around here?” Siri will reply “I found a number of burger restaurants near you.” Then you can say “Hmm. How about tacos?” Siri remembers that you just asked about restaurants, so it will look for Mexican restaurants in the neighborhood. And Siri is proactive, so it will question you until it finds what you’re looking for. Ask Siri to text your dad, remind you to call the dentist, or find directions, and it figures out which apps to use and who you’re talking about. It finds answers for you from the web through sources like Yelp and WolframAlpha. Using Location Services, it looks up where you live, where you work, and where you are. Then it gives you information and the best options based on your current location. From the details in your contacts, it knows your friends, family, boss, and coworkers. So you can tell Siri things like “Text Ryan I’m on my way” or “Remind me to make a dentist appointment when I get to work” or “Call a taxi” and it knows exactly what you mean and what to do. Whilst it's unclear how a user can dismiss Siri actions or "chain" multiple questions together (hands-on videos and reviews will clarify that), the technology behind Siri does undoubtedly look very promising. Siri doesn't simply recognize your voice -- it learns over time, understands what you're saying even if you're not completely clear, and more importantly it's fully integrated with iOS 5. The possibility of having conversations with Siri is certainly innovative, enabling the user to go back and forth about data that needs to be adjusted or modified (the meeting example above). As Apple also announced at the keynote, Siri comes with a dictation feature, which is -- again -- systemwide and integrated with the standard iOS keyboard. It will allow you to tap on a microphone icon in the keyboard, "speak your text", and have the system automatically transcribe it for you in any text field. Here’s another amazing way to get things done: just use your voice. Instead of typing, tap the microphone icon on the keyboard. Then say what you want to say and iPhone listens. Tap Done, and iPhone converts your words into text. Use dictation to write messages, take notes, search the web, and more. Dictation also works with third-party apps, so you can update your Facebook status, tweet, or write and send Instagrams. 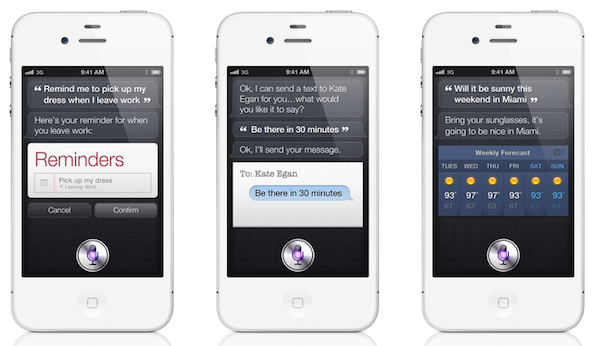 More information about Siri is available on Apple's iPhone 4S webpage. 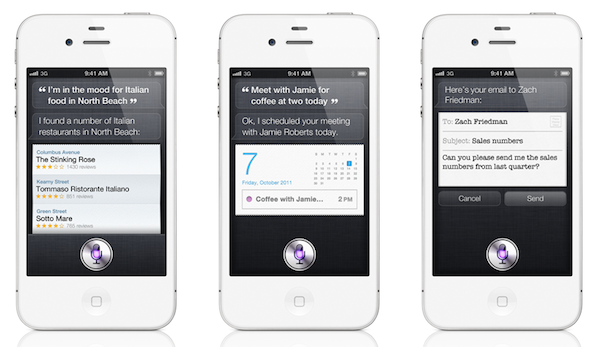 Update #2: And here's a first hands-on video with the iPhone 4S and Siri from the BBC (via 9to5mac). In the video, Siri is asked to check on current weather conditions, and the new iPhone 4S camera is also demoed. Update #3: here's Apple's official YouTube video embed for Siri.